I'm very excited to share a set of sketchnotes I captured for creative agency JESS3 back in June. 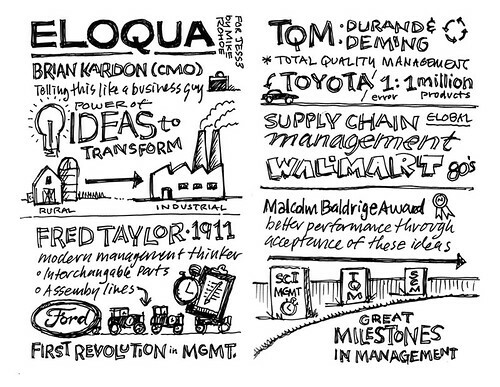 The resulting video and microsite for Eloqua are now live, so I'm free to talk a bit about my sketchnote work for this project. I was hired by Leslie Bradshaw, president and CEO of JESS3, to listen in on a presentation of Revenue Performance Management (RPM) with Eloqua Chief Marketing Officer Brian Kardon. My goal was to convert the ideas, themes and concepts into sketchnotes. Brian spoke about management concepts from the industrial revolution through the present and their context as a precursor to the next revolution in management, RPM. 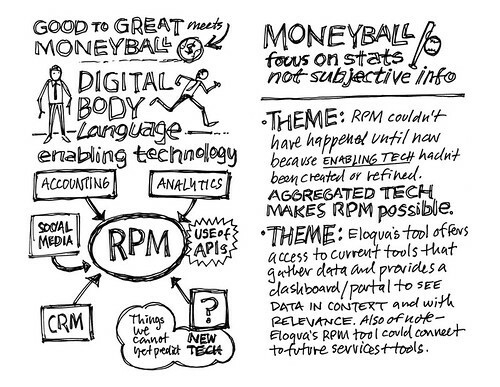 The end result was a concise overview of Brian's RPM presentation as a set of sketchnotes. Written and produced in collaboration with Eloqua, the Future of Revenue video identifies breakthrough ideas – scientific management, total quality management, supply chain management – and looks at the competitive advantage enjoyed by early adopters. The narrative culminates in the emergence of RPM, a systematic approach to analyzing and predicting the results of a business’ largest and least understood cost center: marketing and sales. 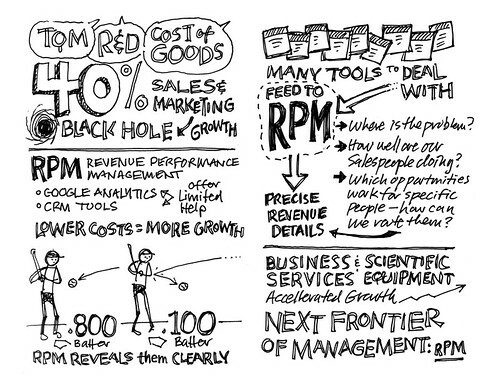 Be sure to check out the Eloqua Future of Revenue microsite to see the complete package. I had a great time on the project working with Leslie, the team at JESS3 and with Brian at Eloqua. Thanks guys. I can't wait to do it again!